Have you used Pinterest to promote your business-to-business (B2B) company? Many consumer-facing businesses have had a lot of success promoting themselves with Pinterest. However, many B2B businesses are still wondering how to promote themselves with Pinterest. Check out how these B2B businesses are using Pinterest. Try to replicate their techniques for your business. Here are 7 tips for successfully using Pinterest for your B2B business. Posting attractive infographics on your blog can be a great way to promote your B2B business on Pinterest. A well-designed infographic with helpful information can get you lots of pins and repins. Dan Zarrella's study shows that taller images like infographics are more repinnable. 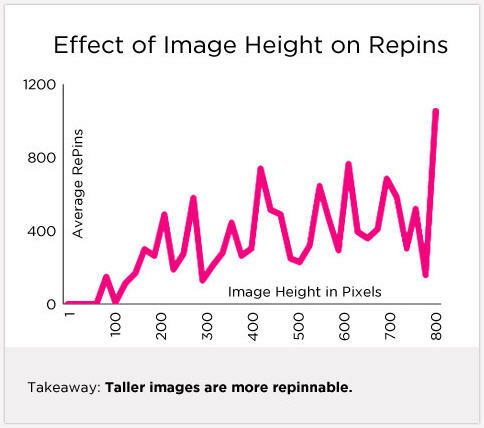 A recent infographic titled “How to Get More Pins and Repins on Pinterest” by Dan Zarrella shows that taller images are more repinnable and infographics are usually quite tall. So focus on creating tall, detailed infographics. One example of a B2B company having success with infographics is KISSmetrics. They regularly create and post attractive infographics with useful information other businesses can implement. 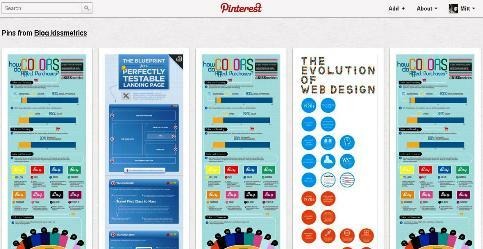 The infographics they post get pinned and repinned many times on Pinterest. If you visit KISSmetrics’ blog, you’ll be able to see all of the wonderful infographics that are being shared. A great example on which you could model your infographic is “How Do Colors Affect Purchases?” There are many facts and figures included in this well-designed infographic—it features good use of colors and it’s also quite tall. Create similar shareable infographics for your blog too. Kissmetrics regularly publishes infographics on their blog, which are repeatedly pinned and repinned on Pinterest. Using ebooks, guides, white papers and other helpful documents can be a great way to promote your business on Pinterest. Many people want to download your gated documents, especially if you have a popular blog with quality content. 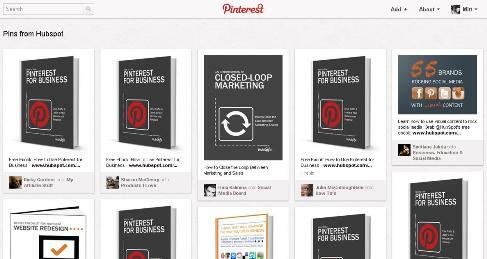 To make them more shareable on Pinterest, you can add attractive cover images to your ebooks, guides and white papers. Post an image of the cover on your document’s landing page. Also make sure you gate the content so people can access it only after they sign up. This will help you collect email addresses and names for your marketing efforts. If your document is helpful and has an attractive image, your readers will want to pin and share it with their followers. 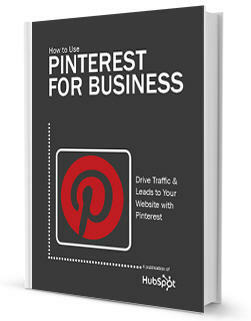 An example of a business using documents on Pinterest to the fullest is HubSpot. They have educational content such as ebooks, guides and white papers on subjects like Facebook, Twitter, Pinterest, Google+, SEO, Analytics, you name it. You can find them on this page. Documents published by HubSpot have beautiful cover images like the one above, which are highly pinnable and repinnable. All of these documents are gated and all have a good cover image on the landing page, which makes them pinnable and repinnable. Documents that are regularly pinned from HubSpot. If you visit HubSpot, you’ll see all of the documents that are being pinned from their website. Social share buttons on the landing pages of HubSpot's documents make it easy to share them and add social proof. Another important point to note is that HubSpot has a Pin It button on their landing pages too. This not only makes it easy for people to share the landing page, but it also adds social proof and credibility. For example, if you visit the landing page of the guide “How to Use Pinterest for Business” and you see that it has been pinned more than 2,000 times, you really want to download it because all of those shares indicate that lots of people have found it helpful. Ever since General Motors took their ads off Facebook, there’s been a lot of discussion on how social media should be used. Businesses need to understand that social media shouldn’t be used for direct marketing, but to engage followers and build relationships with them. This is exactly how you should use Pinterest too. The primary focus needs to be to engage fans and make them feel special and to get them to share your pins, comment on them and like them. Selling your products directly should only be your secondary focus. Do something like you do on Facebook, which could be to ask people to like your pin or to ask people questions in the description, which will encourage them to comment on it. And when they comment on it, you can reply to their comments and build relationships with them. If you keep engaging your fans, you will eventually convert them into customers. Constant Contact's board called "Fanbruary" helps them engage better with their fans, as it's dedicated to them. An example of a company engaging their fans on Pinterest is Constant Contact. If you visit their Pinterest brand page, you’ll see a board called Fanbruary. Here you’ll find pictures of Constant Contact customers and fans appreciating their service. This shows their followers that Constant Contact cares about them and it also works as a testimonial for Constant Contact’s services. Constant Contact pins videos on their board "Ask an Expert," which provides advice to their audience. They also have a board called “Ask an Expert” where they pin videos of experts giving advice. These videos provide useful tips to fans and followers, thereby engaging them. Along with all of these engaging pins, you can also display your products so that potential customers can notice them, and if they’re interested, you could generate leads. There are many ways to do this. You can display pins of your products, which might lead to a landing page; you could just display them creatively to promote engagement; or you could display how your product works. This board has some fantastic technologies built by GE. If you visit the board, you’ll see pictures of compressors, an LED light bulb, an aviation testing facility, etc. All of these pins show visitors what a big company GE is and all the wonderful products they create. General Electric pins images of their products onto their board "Badass Machines." Another great example is how HubSpot highlights their product. On their Pinterest brand page they have a board called “Peek at HubSpot Software,” which contains pins of screenshots of the amazing things their software does. The link provided on the pin leads interested viewers to a demo page where they can register for a customized demo of how HubSpot’s software can help their company. HubSpot pins screenshots of their software onto their board "Peek at HubSpot Software." One of the best ways to engage your company’s fans and followers is to show people that there’s life behind your company’s website and your social media profile. You want to show people what happens behind the walls of your company. This shows users that there are real people just like them working in the office and this encourages them to interact with your employees. It humanizes your company and your social media campaign. You can apply this strategy to Pinterest by pinning images onto a board dedicated to work culture. You could also add your employees as contributors to this board so they can directly add their own images. This way, they will directly communicate with your followers. An example of a company using this well is Marketo. Marketo has a board on their Pinterest brand page titled “Office Fun!” where they pin pictures of Marketo’s employees working and taking part in events and competitions. These pictures show followers that Marketo has employees who are very social just like them. Marketo has a board called "Office Fun! ", which is dedicated to the company's work culture. One of the best ways to promote your brand is to use relevant images. A recent study on Facebook shows that posting relevant images on your profile brings more shares. The same principle applies to Pinterest too. If you are a B2B company that provides marketing services, pin pictures related to marketing; if you’re a B2B company that sells office supplies, pin images of interesting things used in offices, and so on. This way, you’ll build a brand on Pinterest and people interested in that will follow you. Intel pins pictures of technology onto their board "Geek Chic." An example is Intel, which has a board called “Geek Chic” where they pin pictures of technology. If you visit the board, you’ll see pictures of food equipment, USB devices, MP3 jewelry and all sorts of technologies. This works for Intel and helps promote their brand as a company that works in the field of computers and technology. People like it when you take the extra step to serve them and everyone else better. It shows that you really care about them. This could be serving the community, making the world a better place, etc. If you are a company that does this extra work, it’s a good business idea to display it to let your fans know about all of the good deeds you do. If it’s a cause they care about, they will support you and your company. A company that’s doing this really well on Pinterest is FedEx. On their brand page they have a board called “FedEx Community Involvement” where they pin pictures of their crew members cleaning the environment, making donations, rescuing animals and many other things they do to serve their community. Visit their board to check it out. All of these images show that FedEx cares and convince people to do business with them. FedEx pins images of how they serve the community, which helps build a better brand image. Another fantastic board they have is “FedEx EarthSmart” where they pin images and videos of steps they are taking to minimize their environmental impact. As FedEx delivers items, they use a lot of fuel, packaging material, etc. By showing they’re taking extra steps not to hurt the environment this shows that they care. This goes a long way in persuading people to work with them. FedEx shows people how they make an effort to lessen the harm they cause to the environment by pinning images and videos of the steps they take. These are just a few examples of how B2B businesses can successfully use Pinterest. If you take a good look at your products and services, you should be able to come up with creative ways to promote your B2B business with Pinterest too. What do you think? Have you used Pinterest to promote your B2B business? Have you got any tips you would like to share with us? I would love to hear your thoughts. Please leave your comments in the box below.